Courtney Solomon is no Justin Lin. Solomon could hardly even be considered a player at all in the action genre as he's only made three films and the first was 2000's Dungeons & Dragons adaptation that I never saw because I was both too young to care about it at the time and would have likely been massively confused if I had. I never played the game and the current 10% tomatometer score doesn't bode well for it either, but what really put the anticipation in the can for Getaway was knowing that Solomon also directed 2005's An American Haunting. I remember taking a date to that film and apologizing for how bad it turned out to be because it was my idea to go see it. With this third feature the director has made one of those films where all of the action revolves around a certain set of people locked into one location. This certainly might make things easier from a production standpoint as you don't have to deal with a ton of location scouting or all of the dynamics that go into orchestrating a production with a large cast involved, but when your location of confinement is on wheels there seems a much more complex scheme to choreograph and Getaway never seems to take advantage of its circumstances other than to feed us corny dialogue and messily shot action sequences that seem more thrown together than thought out. To be honest, there wasn't much expectation going into the film, but when you have such a simple premise and what seems to be outlandish execution paired with the fact that actors with the caliber of Ethan Hawke and the rising star of Selena Gomez presumably seeing something in the project you hope it might prove to be a fun, if not distracting experience. And yet, there isn't even an intentionally campy vibe to the project as it, for all intents and purposes, is as serious as a heart attack and with that tone does little to add fun to the predictable and lacking story that can't even sustain the brief hour and a half running time. Selena Gomez and Ethan Hawke re-make Phone Booth, but with a fast car. From a script (if you could even call it that) by Gregg Maxwell Parker and Sean Finegan (yes, it took two people to write this and yes, it is the first feature for both of them) the story kicks off by introducing us to Brent Magra (Hawke) a former race car driver who comes home from work to find his wife kidnapped and is forced into a car, a Mustang Cobra that is covered in cameras and other technology, while being coached by an anonymous voice (Jon Voight) from behind the technology to complete these crazy, seemingly pointless tasks so that he may get his wife back. The film takes place in and around Bulgaria, but if it weren't for the police cars this could have pretty much been anywhere. Whether the ominous voice behind these devious plans intended for Selena Gomez to show up and try to take back her stolen car is a mystery when she enters the vehicle a few minutes into the film and holds Magra at gunpoint. The film could have even settled here and become a kind of buddy/action flick that creates an interesting enough chemistry and dynamic between its two characters that even if the story is cliche-ridden we might at least forgive it due to the appeal of the pair. Unfortunately, Gomez is laughable here after doing such good work earlier this year in Harmony Korine's Spring Breakers and Hawke just seems rather awkward having to deal with what in all actuality is this young pop sensation while genuinely trying to act and elicit some emotion from Magra and his situation. The film stumbles along with pointless car chase after pointless car chase captured in frustrating shaky cam and countless close-ups to the point we can't tell what is going on half the time. Cop cars come out of nowhere for no apparent reason and then, just as the film seems to be nearing a conclusion it picks up again and goes for another fifteen minutes for no other reason than to seemingly fill its 90-minute quota. Beyond these more obvious issues, we also have to suspend disbelief and take Gomez as a credible tech wiz who is able to hack into servers and use her iPad to fool the bad guys into thinking they are in the car when they're not actually in the car and it's all just really messy and not well thought out. At one point Gomez's character goes into a power plant (naturally) and tries to hack their system so she can reach 911, but of course Voight's baddie intercepts the call and tells her everything she has thought of he is already one step ahead of. This only for him to be fooled in the next scene by Gomez's simple trickery with her apple product that causes a major wrinkle in Voight's plans. Sorry if you consider any of this spoilers and without pointing out too many plot points and why they could be called flawed it is easy to just go back to a root question and wonder, what is point of it all anyway? I was wondering the same thing myself the entire time and when the film does reach its first climax, in an abandoned warehouse (naturally), we are served a reason that is so generic I couldn't believe Ethan Hawke's reputation had led me to waste time on this. When the movie didn't end there and continued on for one last car chase and our protagonist was finally able to speak with his wife's captor (though never face to face) he serves up a different justification on top of the already typical explanation that almost makes it even worse. It may in fact be the most unsatisfying reveal of the year and this is coming from someone who found R.I.P.D. to be not AS bad as everyone was saying. In short, this film makes little sense. It is hard to even concentrate on the action taking place or the plot of what the characters are trying to achieve due to the fact you are constantly pointing out contradictions in what was just spoken as dialogue and what they are now trying to do. It is a dumb film that can't even make up for its idiocy with well-crafted stunts. 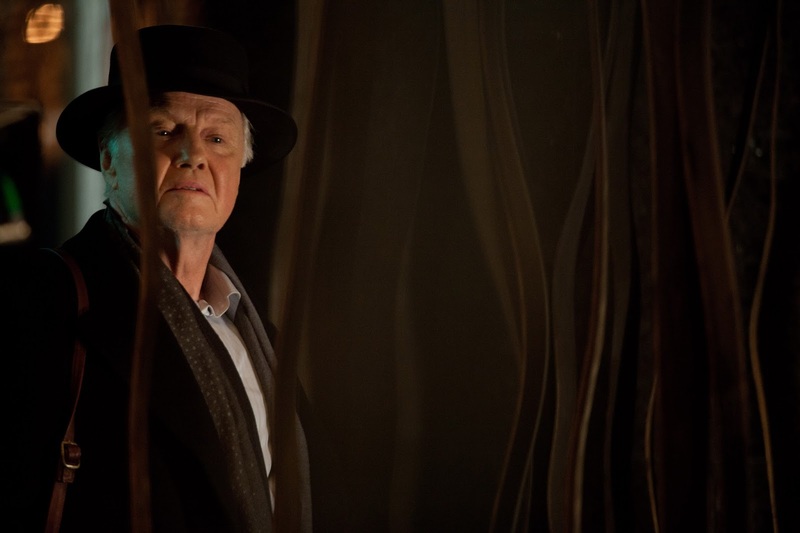 Jon Voight is a mysterious baddie who is often heard but rarely seen. 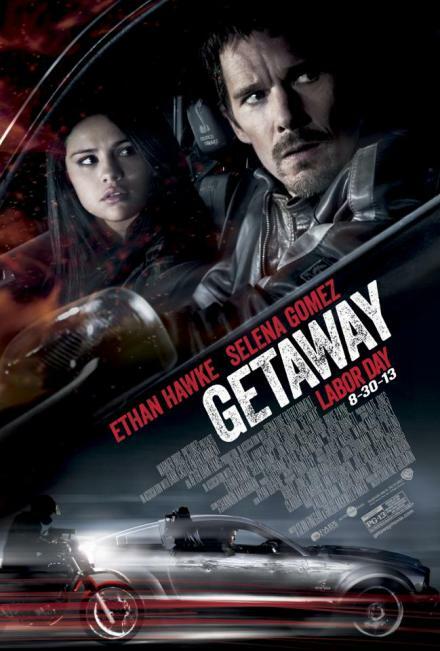 If there is one positive thing to say about Getaway it is that for all the car crashes that aren't documented right and all the convoluted and forced plot points that allow Gomez to outwit the all-knowing antagonist, there is a sequence near the end of the film that is one long take and is from the perspective of Hawke's character as he is chasing a vehicle and as it weaves through traffic, running red lights and almost colliding several times with oncoming traffic the shot does not break, doesn't shutter and it is truly thrilling. I was holding my breath during the sequence, its scope the clearest of any shot in the film and it was honestly the best part of the entire movie. It was well documented, clearly well thought out, and it created that right sense of tension and of pressure that Solomon was trying to capture the entire time by having his principle cast members locked in a fast car the entire running time. If there would have simply been a few more scenes such as that in the film and not even necessarily in the same style, but with that same kind of inventive enthusiasm I would have been better able to forgive all of the shortcomings this film has working against it. Since the year has started both Hawke and Gomez have now appeared in some of the best and one of the worst films of the year (and I hope you all know I'm referring to Before Midnight and not The Purge). I like that Hawke is taking these odd genre pictures on the side and expanding his fan base, but if he's going to continue to do this he should definitely start taking a better look at scripts and who will be directing them before signing on. I'm sure he had a great time driving fast cars and outrunning cops that he would seemingly cause to jackknife and flip across the screen (for no apparent reason), but it isn't as nearly as endearing or interesting as watching him drive a car carrying his two daughters and having a conversation with his long time lover about his son and the life they've made for themselves.